The University Library, in the Media library has a room for high quality projections. Both contents in standard quality (DVD or any other standard sources) and in HD quality (BluRay or any other HD source ) can be reproduced. In addition, it is equipped with all the necessary material to make professional video conferences and webcasts. 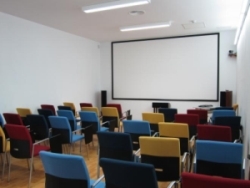 This room is designed to prepare presentations, lectures, or any other type of event with the exclusive limitation of the number of posts available (maximum 40 persons). For a videoconference, webcast or any other activity that requires prior planning, you need to book at least 15 days in advance. It has a Dolby Surround 7.1 audio equipment, Full HD (1920 x 1080) projector, DVD player, Blu-ray player, videoconference equipment Polycom HDX 8002, room microphone and a 42 '' plasma screen. Its use implies the knowledge and acceptance of these rules. It must have only an academic or institutional use (any request for a personal use will be rejected). The applications must be sent by academic or administrative staff, on behalf of a UA Service or Department. The room can be used from 9:00 a.m. to 20:00 p.m. The booking holders themselves are responsible for the room. The applicant must fill the reservation request. The fact of sending the form does not imply the booking to be confirmed. Applications may be subject, exceptionally, to possible suspensions or rescheduling of timetables or dates, for technical reasons or force majeure. Due to organizational reasons, only an extension of no more than 15 minutes over the reserved schedule will be allowed. Once the request has been accepted, the applicant may ask for an interviw with the staff if he needs some special equipment. Any cancellation of a reservation must be notified as soon as possible. When you reserve with the purpose of screening you need to do it no less than 2 days before. If you want to make videoconferences, you have a 15 days period. Before the screening, the whole installation will be checked by the staff. In the case of videoconference, the applicant will be asked to go for verification. Any events that requires technical support must take place during the technical staff working time. As a general rule, the acts will be hold with the technical resources available in the room. The use of external elements must be communicated and tested, in order to determine the compatibility. The distribution of elements in the room must not change, except for force majeure, and it will require a prior request. The room must be left in the same condition it was before beeing used.